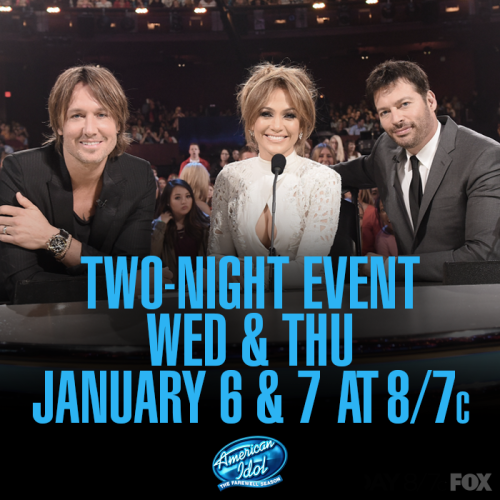 In just over a week, on Wednesday the 6th of January, American Idol will begin airing its final trek around the country to find a star and the pressure is on for the franchise and the judges (Keith Urban, Jennifer Lopez and Harry Connick Jr. are all returning) to find one last superstar, while simultaneously paying tribute to the fourteen seasons that came before. The stakes are that much higher given that the last notable group of singers came in 2012 during the show’s 11th season, which yielded folk-rocker Phillip Phillips and Christian rocker Colton Dixon—both of whom sold and still sell a fair chunk of albums. That’s not to say that the last three seasons haven’t had their share of talent, nor that the wrong people won, but perhaps the show’s recipe for finding a winner is missing a few key ingredients that make the final product taste just slightly different. With that in mind, I’ve devised a few suggestions for how the show can go out in a blaze of glory and be remembered as the pop-culture machine that it once was. 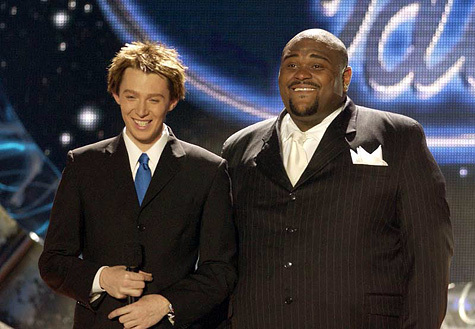 Many Idol fans will remember the nail-biting finale between Ruben “the Velvet Teddybear” Studdard and the always quirky Clay Aiken. Credit: FOX Entertainment. Idol will forever be known as “The House That Kelly Clarkson Built” (and that Carrie Underwood added a second floor to), but true Idol fans want a more in-depth tour of the house. We want to sit on the sofa where we watched the nail-biter of a finale between Ruben and Clay, we want to sit at the kitchen table where we watched a tearful Fantasia triumph after a rip-roaring version of her victory song “I Believe.” We want to walk the hall where pictures hang that remind us of when the older David Cook conquered the younger David Archuleta after some harsh feedback from the judges the night before or where underdog Kris Allen took down one of Idol‘s biggest personalities, Adam Lambert. All this is to say that Idol has a tendency to neglect some of its alumni in favor of others. It shines the spotlight on those who don’t really need it while neglecting some of the best talent the show ever had. The best way to go about a thorough recap of the seasons might be to devote one week to each season and bring back as many members of the cast as possible to reprise performances or give us a taste of something new. I can almost guarantee that those who choose to tune in to Idol‘s final season to remember the good old days will appreciate a glimpse of the lesser-known personalities as much as those we hardly need reminders of. It’s quite possible that in the hubbub of trying to do justice to Idol‘s first fourteen seasons, the audience, producers and—by extension—judges, neglect the task of finding a winner worth of Idol‘s final crown. As someone who has watched every season, my hopes are two-pronged for the final go-around. And one of those prongs is to be blown away by new talent and to feel that same satisfaction that I’ve felt many times before when the confetti falls in May on the person that America has deemed worthy. The best way to go about finding this person is quite simple, but Idol often ignores it for some other predetermined agenda. I offer Season 5 (when Taylor Hicks triumphed over Katharine McPhee and Chris Daughtry), Season 7 (the infamous David vs. David Showdown), and Season 11 (Phillip Phillip’s victory) as the best examples of what I mean. In these seasons, the judges assembled a cast with multiple plausible winners in the bunch. 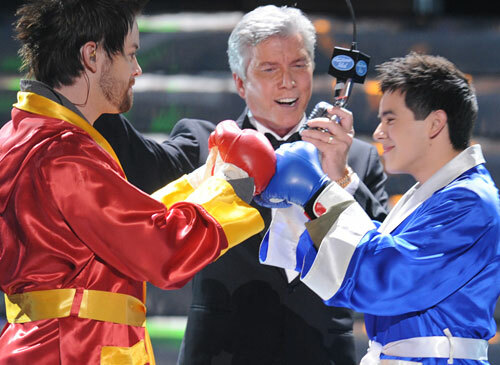 There was a variety among the contestant’s genres (i.e. Hicks’ soulful style versus McPhee’s pop ballads and Daughtry’s penchant for rock), but most of all, there was plenty of personality. We got to know the contestants in ways that NBC’s The Voice fails to do with its race-to-the-finish style. We cared about who won and their personal journey, which is a part of the game that Idol’s first winner, Kelly Clarkson taught us. Her waitress to pop-powerhouse story inspired us and made her the “idol” that the show claims to find. Compare these seasons to Idol’s 12th season where the male side of the equation was stacked with duds (no offense, guys) in order to produce Idol‘s first all-girl Top 5 and first female winner in many seasons. At the time, the season was the show’s lowest rated to date and left many viewers cold on the its ability to naturally find a star. In short: Don’t let the lure of nostalgia overshadow the need for a group of talented, interesting finalists to carry Idol home. Step 3: Keep It Simple, Simon. Part of Idol‘s journey down memory lane ought to be a humble realization that they have learned from their mistakes. Let’s avoid overwrought themes (Motown, anyone?) for more surprising and unexpected themes. Some of the show’s best performances came out of themes that no one would have expected to yield show-stoppers (i.e. Blake Lewis’ “You Give Love a Bad Name” during Bon Jovi week). That’s not to say the show needs to go as specific as Bon Jovi Week. In fact, I encourage the show to broaden the catalogue to give the new crop of contestants more creative freedom in order to better show us how they’ll compete in today’s cut-throat music industry. Some of today’s stars (i.e. Tori Kelly, Shawn Mendes, even Justin Bieber) started their career with quirky covers of current radio hits on YouTube so let this group do the same. If we’ve learned anything from the past few seasons, seeing a contestant sing “I Don’t Want To Miss A Thing” by Aerosmith for the umpteenth time rarely yields good results. In addition to song choice, the show needs to take a step back and look at which formats gave us the best chance to get to know the contestants from week-to-week. Although Seasons 4 through 7 offered the tried-and-true method of gradually eliminating 4 members of the Top 24 each week until we had a Top 12, this format broke the bank in Season 9 when we lost three talented and interesting members of the group (indie/acoustic singers Alex Lambert, Katelyn Epperly and Lily Scott) due to “vote splitting” between similar personalities (like future runner-up Crystal Bowersox). That said, Season 14 seemed to find a format that worked. The Top 24 went to a Top 16 without much heartbreak about who went home and from there, we got a Top 12. I wouldn’t be opposed to them maintaining this format, but it’s good to give the audience a chance to hear the semi-finalists sing more than once before choosing their favorites. In Season 7, for example, it wasn’t until Week 2 of the semi-finals that David Archuleta delivered his show-stopping version of John Lennon’s “Imagine.” Now imagine a world without that performance… it’s not easy, even if you try. 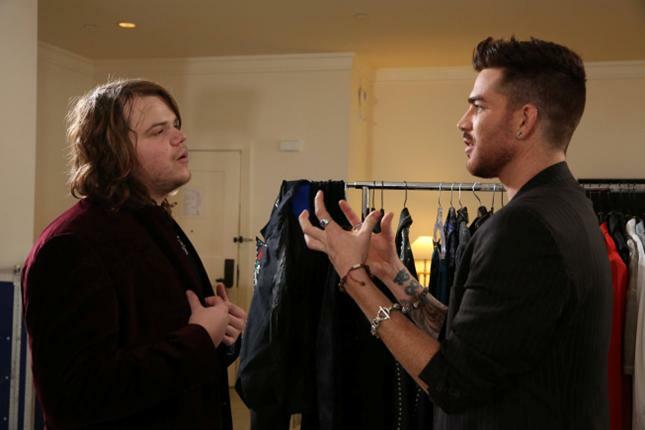 Season 8 alum Adam Lambert mentors Season 13’s winner Caleb Johnson. Credit: FOX Entertainment. I’m not holding out hope that the Idol producers are furiously Googling suggestions for their final season. In all likelihood, the format has already been determined. Instead, my hope is that they’ve done like any good coach and reviewed the tapes of seasons past to determine the best course of action going forward. There are, of course, other things they could do to improve the show, like avoid using Season 14’s electric chairs of doom and gloom for the weekly eliminations and, instead, do what they did during the penultimate season’s Top 4 elimination where every contestant was to assume they were singing for the last time on the show. The results, while likely stressful for the contestants, yielded some of the season’s best performances. Similarly, there is something to be said about having ex-contestants like Kelly Clarkson, David Cook, and Adam Lambert mentor the contestants. These people know the ropes better than anybody and their advice, humor, and presence on the show makes for good TV. Bonus points if there’s some new faces and some tie to the theme (i.e. Chris Daughtry for rock week, Jennifer Hudson for R&B, or new-found success story Kellie Pickler for country). That being said, the final season will inevitably be a bittersweet journey with promises of a triumphant return from Idol‘s original trio of judges (Randy, Paula and the always opinionated Simon Cowell). As I have done for the past three seasons, I will be writing recaps after every episode with my own personal thoughts on the night’s proceedings. Hopefully I can count on you joining me one last time to discuss Idol‘s big finish. If so, I’ll see you back here the day after the first two episodes of Idol’s farewell season on Wednesday January 6th and Thursday January 7th at 8/7C. Will you be tuning in to the two-night event? Let us know in the comments below!